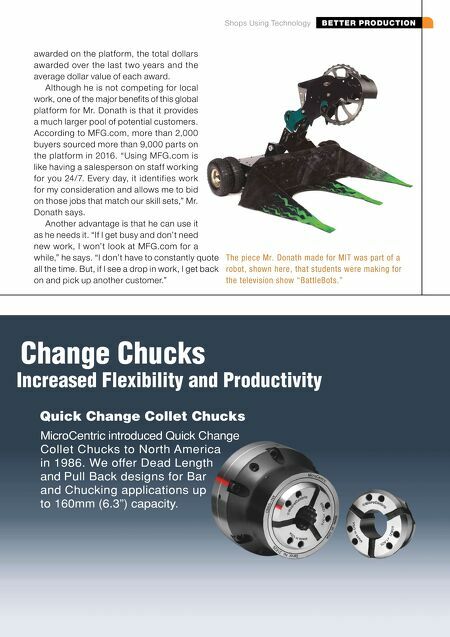 mmsonline.com September 2017 MMS 119 BETTER PRODUCTION Shops Using Technology Quick Change Collet Chucks MicroCentric introduced Quick Change Collet Chucks to North America in 1986. We offer Dead Length and Pull Back designs for Bar and Chucking applications up to 160mm (6.3") capacity. Increased Flexibility and Productivity Change Chucks awarded on the platform, the total dollars awarded over the last two years and the average dollar value of each award. Although he is not competing for local work, one of the major benefits of this global platform for Mr. Donath is that it provides a much larger pool of potential customers. According to MFG.com, more than 2,000 buyers sourced more than 9,000 parts on the platform in 2016. 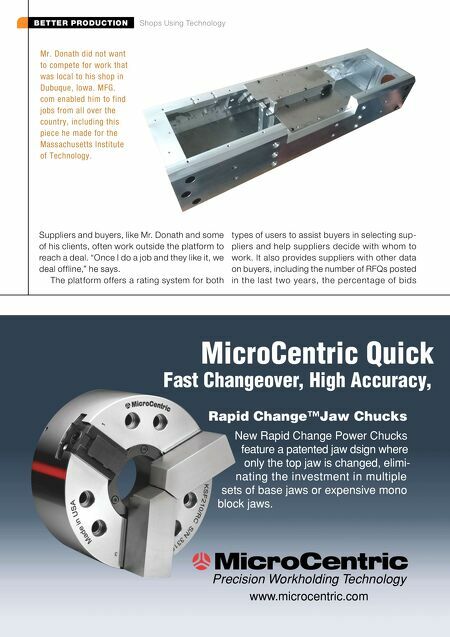 "Using MFG.com is like having a salesperson on staff working for you 24/7. Ever y day, it identifies work for my consideration and allows me to bid on those jobs that match our skill sets," Mr. Donath says. Another advantage is that he can use it as he needs it. "If I get busy and don't need new work, I won't look at MFG.com for a while," he says. "I don't have to constantly quote all the time. But, if I see a drop in work, I get back on and pick up another customer." The piece Mr. Donath made for MIT was part of a robot, shown here, that students were making for the television show "BattleBots."